More frequently we are hearing that motorist are being struck by vehicles that do not have insurance. Uninsured drivers are a danger to us and our families on the roads. Without insurance, victims of automobile collision are often left without any ability to be compensated. In South Carolina, it is illegal to drive without proper insurance coverage. South Carolina law requires that you purchase liability and uninsured motorist coverage to drive in the state, which is divided into two coverages: bodily injury liability and physical damage liability. Many uninsured motorist collisions involve hit and runs, drivers who are not authorized to operate a vehicle, or even driving a vehicle that was stolen. The most recent study, performed by the Insurance Research Council (IRC) in 2017, shows that approximately 13.0 percent of motorists, or about one in eight drivers, are uninsured. Stated differently, approximately 29.7 million drivers who are uninsured. Usually, in a car accident, the insurance of the driver who is at fault covers initially the injuries and damages. But, with 13% of drivers uninsured, victims of auto accidents have many questions about what to do when involved in a collision with an uninsured motorist. The law in South Carolina allows a victim of an uninsured motorist to receive compensation. South Carolina motor vehicle insurance laws are intended to protect citizens against uninsured drivers. In fact, the law requires that every auto insurance policy sold in our state includes “uninsured (UM) motorist coverage.” Uninsured Motorist Coverage can provide you protection, but successfully bring an uninsured motorist coverage claim often requires an attorney to get you the best recovery. We have found that it does not cost much more money to have double or triple this amount, and often times drivers need in excess of $100,000 or $300,000 for each vehicle. 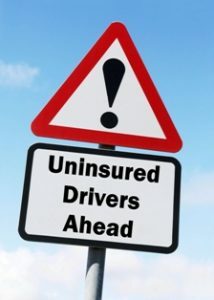 After you read this article, please check your insurance policy to see how much uninsured motorist coverage you have listed, and call your insurance agent today to get increased coverage. The compensation that you are entitled to receive with uninsured motorist coverage would cover all legal damages that you are entitled to recover under the law including medical bills, chiropractic treatment, future medical expenses, lost wages, diminished earning capacity, pain and suffering, mental anguish, property damage, and in certain cases, even punitive damages. Don’t worry, your insurance premiums should not increase for having to file a uninsured motorist claim because this is mandatory coverage and it is not your fault that the at-fault driver was negligent and failed to get insurance. It can be difficult for victims of an uninsured driver to successfully navigate the laws of an uninsured motorist claim on their own. It is easy to be mislead by the insurance companies in giving recorded statement, not understanding the forms they want you to sign, or being uninformed about how much compensation you should receive for your injuries. If you say or do the wrong thing in communicating with the insurance company, you may lose important benefits allowed under the law. The auto insurance company will have a team of attorneys that will attempt to defend the interests of the insurance company over your own best interests. As with any collision, try to get as much information as possible about the driver. Ask the driver for his name, contact information, driver’s license number, and a copy of his insurance card. Take pictures of all the damage to your car, the other cars, and the license plate on any vehicle involved in the collision. Ask anyone at the scene if they saw or heard the collision, as it is important to get the names and all contact information of any witnesses. Now these days, the chances that the collision was caught on camera is greater. Look around to see if there is a traffic camera that could have captured the incident, or any surveillance camera at a neighboring businesses. Never rely solely on the police officer to get any of this information. We have seen that police do not take the time to do a thorough investigation, so make it a priority for you to gather as much information on the scene. Whether the other driver is cooperative or not, call the police immediately. This is especially true if the damage is extensive or injuries are sustain. The police will document the incident and should provide you with an FR-10 Report, which is an exchange of driver information. Also, the police should prepare a TR-310 Traffic Collision Report, which is the complete accident report. TR-310 Traffic Collision Report is generally available within 30 days after the collision from the SC Department of Motor Vehicles. These police reports can become critical to any insurance claim. For example, without a police report you are barred for recovering for any hit and run collision under South Carolina statutory laws. The insurance company should be contacted the same day of the collision, or as quickly as possible. Call your insurance company and follow the necessary steps to inform them of the accident. The insurance company will want you to send in the FR-10 Report. Notifying your insurance company will not increase your rates if the other driver is at fault, and is essential if the other driver is uninsured. Your insurance company will be able to determine if your policy covers uninsured drivers and offer directions on what to do next. If you have substantial injuries, you should not give a statement to the insurance company without first seeking the advice of the best attorney you can find to answer your questions. The Goings Law Firm has years of experience helping victims of collisions caused by negligent uninsured drivers. Bringing an uninsured motorist claim in South Carolina can be difficult on your own, and without the best attorney for your case, you may not get the compensation that you are entitled under the law. Contact us today for a free case evaluation or call us at 803-350-9230.